Fred Patterson frequently appears on CHCH News to discuss issues of the day. Today, for example, he debated whether there's anything wrong with Crime Stoppers in Toronto handing out condoms at the Gay Pride Parade. You can see that appearance here. 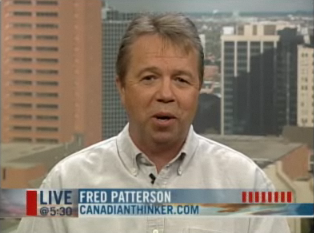 Not only did he mention the Humble & Fred condoms, but when he's on the air they reference him as Fred Patterson from CanadianThinker.com. I thought that was pretty cool, and here's why. yeah that's just grand. well mike, i have to hand it to you. i've never seen you censor a comment..
And more importantly, why were the comments censored? If we revisit the code of conduct for blogging written about at http://www.torontomike.com/2007/04/my_thoughts_on_oreillys_code_o.html we know the main rule is "We take responsibility for our own words and for the comments we allow on our blog." If a comment crosses the line, poses a threat to a person or simply acts as troll food or micro link farms, they should go. State your case Mr OJ! Have you seen comments disappear on other blogs? Mike: Freddiep does on occasion censor comments – I agree with Jason there. Then again, its his blog so if Fred wants to censor its up to him. If it happens too frequently I’m sure hits and comments to his blog will drop. Ok, but what is he censoring. There's no way he's deleting comments because he disagrees with them. Is it personal assaults he's deleting and is he doing it at Canadian Thinker? I have had a few comments never appear on Freddiep.ca. I am not sure if Fred didn't like them or if the filter forced Fred to review them and he just never got to it. I have never seen anything like it at CanadianThinker. I have seen one comment Fred altered. A frequent poster made a very rude and hate filled comment about a gay person deserving to get HIV and die. Fred removed that comment and my response to that comment. I can understand why Fred would remove it but I think that it should have remained to show what kind of person the poster actually is. Unless of course it was someone posing as that person to create conflict. Freddiep.ca has a sensitive comment spam filter - that's my fault, but a necessity really because of all the comment spam that there'd be otherwise. So yes, many comments will get caught by this filter, especially if they include swears. When a comment is caught by this filter, Fred (or I) has to login and manually approve it. More often then not this moderated comment gets junked with all the viagara ads, etc. I think it's appropriate to delete hate mongering posts like that one you alluded to. I simply asked Argie if he didn't have something better to do than rag on the homeless.. like perhaps listen to AM 640. (we were discussing David Miller and Calamity Jane Pitfield) It was tongue in cheek and when it was deleted, the whole thread didn't make sense anymore. As for Canadian Thinker, this just encourages me further to not participate. You may notice I no longer link either of those sites, because I don't endorse them. Censorship is necessary sometimes but hopefully we can all express our opinions even if they are politically incorrect. Since I frequently see the Catholic Church, the US, GW Bush attacked mercilessly, I assume its OK to criticize gay people, Islam and feminists in the same manner. I’m guessing it’s probably not. "Ok, but what is he censoring. There's no way he's deleting comments because he disagrees with them." Not entirely accurate, for what it's worth. Hmmm, I can't speak for Fred, but I'm sure he had his reason. I know Fred doesn't censor b/c he doesn't like the opinion, but he also doesn't want his site to be a place where people attack his radio friends and colleagues and future colleagues. Argie, are you criticizing gay people because they're gay? That's quite different than criticizing Dubya for lying to his 300 million bosses as justification for a war that continues to kill young Americans on a daily basis. We're not criticizing Dubya for being heterosexual, white and American. Argie, if it's not hateful I think it's fine. Even your ragging on the homeless. Opinions shouldn't be silenced. There are a lot of angry people who have shows on AM640. That's my opinion. Others would agree. I can see how and why Fred would want to censor or deny that opinion, but it's my opinon. No need to name names. I have no need to criticize gay people or the other groups. We should be able to give an opinion as to that chosen lifestyle. If you say its not a ‘choice’, perhaps we should deal with it as a mental illness. See there, that’s an opinion without any hate. You may disagree with it but its not intended to cause physical harm to anyone. As for Bush, he’s not killing those soldiers, the insurgents/terrorists are. It was an INVASION, not a war. I believe that's an opinion full of hate. You're equating consensual, adult sexual preference with mental illness. It's hateful, and I disagree strongly with it, but it's your opinion and it's not something I'd delete from the comments. Argie, I personally find your comments fine minus the part about calling it a mental illness. I don't agree with your Bush comments either, but I think you should be able to state them. I think it's time for The Argie Blog. Argie, for a few bucks I'll walk you through the steps, set up Movable Type and teach you how to use it. I see www.arguewithargie.com is still available. Mike: How much money can make from it? I wonder long it would be before someone takes me to the Human Rights Comn. The fact that you three are conducting the argument about cencorship and not the government makes me realize how great it is to live in a free society. Hateful opinions should be removed, personal attacks should be removed - differences of opinions should be appreciated, no matter how wrong Argie is about the Bush administration - PS it is the Angler I'm after - he is the real beast. Argie, you're pretty tame compared to certain others. Trust me amigo. Although, keep it up and I'm sure you'll have your very own talk show in no time. Jason: There are plenty of left leaning talk radio hosts. John Moore certainly is as is John Downs at am640. I’m sure there are others that I can’t name right now. I wouldn’t even categorize Freddie or Stafford as complete right wing. They’re fiscally conservative but definitely socially liberal. The only true full on right winger is John Oakley. Wouldn’t you agree? No Argie, I wouldn't entirely, but thanks for the input. Point noted.